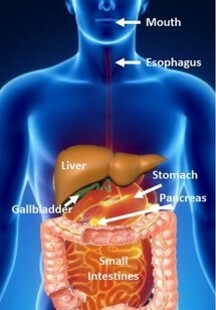 The creation of toxins for the body to deal with, stressing organs like your liver. Fermented, rotting food feeds unhealthy life forms in your body like: yeast, fungus, and parasites. Acids are produced which can lead to “acid indigestion”, commonly known as GERD. It can be very embarrassing! The following list contains some of the more common stressors which will cause indigestion. Improper Chewing. Saliva contains digestive enzymes not available anywhere else in the digestive tract. Example: Digestion of starches and carbohydrates begin in the mouth. An enzyme is secreted into the saliva which begins the digestive process. The enzyme continues to break down the food as it sits in the stomach. When the food leaves the stomach and enters the small intestines the pancreas secretes an enzyme which completes the digestion of the food. It cannot begin and complete this process. If you don’t chew your food well, it will not digest well. This is one example of the importance of chewing. Chewing also breaks food down into smaller, more digestible particles. There are many theories on how long or how many times to chew you food. Just chew it until it is a liquid in your mouth. Drinking fluids with meals. This habit dilutes the digestive enzymes. Drink enough fluids before (30 minutes) and after (60 minutes) to prevent dehydration and thirst. If you chew your food until it is liquid, you will not be thirsty during the meal. Try it! Eating too many cooked foods. Raw foods contain naturally occurring enzymes which aid in digestion. Cooking destroys these enzymes. Develop the habit of eating raw vegetables, like salads with a variety of veggies. Certain situations, however, will cause a lot of pain when eating raw. If this is the case take it slow. And consider “digestive enzymes”. Overeating causes the digestive system to work very hard to process large amounts of food. Certain combinations of food can put a burden on the digestive system. For example, fruits eaten on an empty stomach can clear the entire digestive system in as little as two hours. Meat can take as long as 24 hours. Grate an apple and set it out for 24 hours. Observe what happens to the apple. It will begin to rot and ferment. The same thing can happen in the stomach, small and large intestines. Gas and bloating is the result. Fruit is considered to be a very cleansing food – but not if it rots! Eating late at night or before bed is not a good idea because your digestive system slows down when sleeping. Eating “nonfood foods” is like eating plastic. Much of the foods we purchase today “look” like food, “taste” like food, but, because of processing, are no longer food. An example of a nonfood food is margarine. Margarine looks and tastes like butter, but it is not food. Under the microscope margarine resembles plastic! Scientists have called margarine “plastic butter”. The human body cannot break it down. There is one thing which won’t only stress the digestive system but will SHUT YOUR DIGESTIVE SYSTEM DOWN! And that is stress itself! Stress will literally shut down the process of digestion.